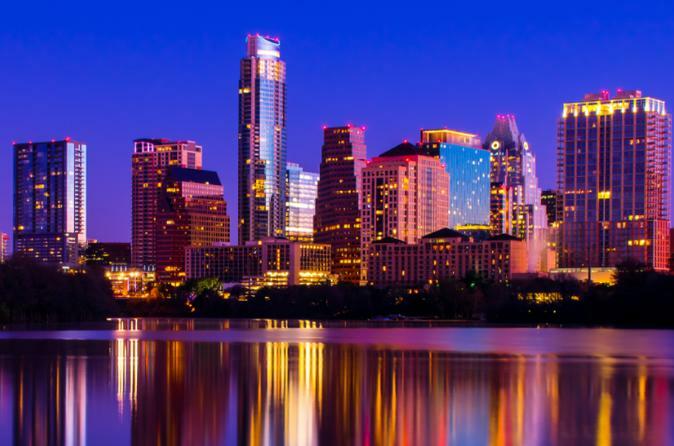 Our Skyline Lights Segway Bat Tour consists of a fun evening glide through Downtown Austin, TX featuring many of Austin's must-see's and hot spots. Children weighing more than 60 pounds are allowed! Segway Orientation and Safety Training is provided. This tour begins with you meeting your tour guide at 1403 Lavaca Street, Austin, Texas 78701. You will have your helmet fitted, receive and orientation to the Segway, and a one on one training with your guide. Once everyone is feeling comfortable, you're off! Your 2 hour Segway adventure will take you through downtown with a stops at the Driskill Hotel and State Capitol Building. You will stretch your legs during these foot breaks. You will be eager to hop back on your Segway for more fun on 2 wheels. Miles upon miles of constant sightseeing will be covered. Along the route you will hear historical facts and interesting stories from your tour guide. The sun will set during this tour, resulting in the lights of the city illuminating the streets below. Enjoy the beauty of Austin while cruising on the best mobile transportation device known to mankind!